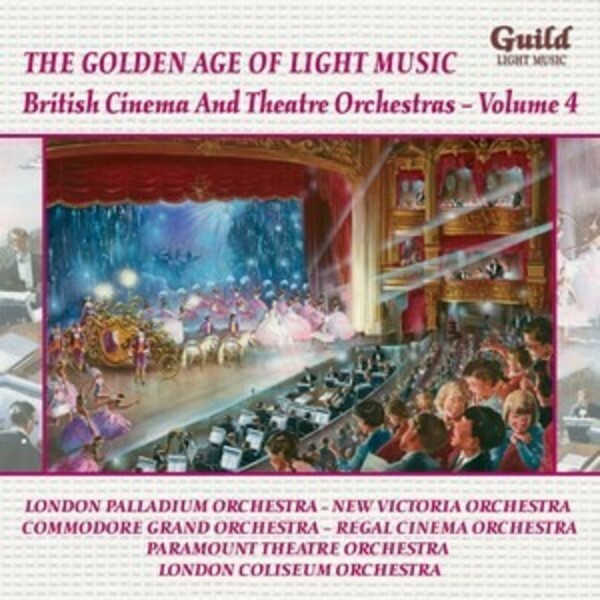 With this fourth collection of 'Cinema & Theatre Orchestras' we are again back in the 1930s and 40s, when virtually every theatre and many cinemas in Britain boasted their own resident orchestra. Not surprisingly, the best of these were to be found in London and nine of them appear on this CD. Many recordings featured not only the cinema or theatre�s orchestra but its organ as well, and you can hear examples recorded in The Commodore Theatre, The Paramount and Regal Cinemas plus one featuring the organ which was briefly installed in The London Palladium. De Groot and his superb New Victoria Orchestra appear on Guild for the first time, but the highlight of the collection is a rare 1930 recording, never released in Britain, of a selection from 'Les Saltimbanques' played by The Regal Cinema Orchestra with Quentin Maclean at the organ.